Blue Ridge Healthcare asked Johnson Development to develop a new MOB on its hospital campus in Morganton, North Carolina as part of dramatic campus improvements for this campus and Blue Ridge’s Valdese campus, which would be undertaken simultaneously. The implementation of the master plan included a major addition to the hospital as well as the new medical office building. The Johnson Development team included the use of the contractor on site (significantly reducing general conditions and cost coordination issues), as well as a regional architecture and engineering firm with existing ties to the Blue Ridge system. 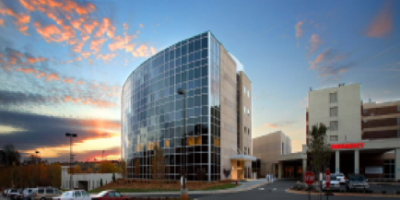 The new building site was very constrained (parking deck, large diameter water line, the hospital, and the hospital emergency department), resulting in an unusually shaped, but aesthetically pleasing medical office building. In addition, Johnson Development worked with the designers and local authorities to make certain the building could be viewed from the nearby interstate. The glass, precast concrete and steel structure is a clear and visible symbol to the community at large of the hospital’s continuing growth. In addition to coordination and site challenges, Johnson Development was able to provide enough growth space to meet additional physician needs over the next five years, while maintaining Blue Ridge’s current budget. Johnson Development’s role for the design and construction of the building shell, core, and tenant suites was that of developer, project manager, and leasing agent.